Located in Boston’s historic Back Bay this hotel is a destination itself. Renowned as one of the best hotels in Boston, MA, The Boston Park Plaza offers an incomparable location and an elevated level of service. This hotel provides a selection of rooms and suites, all refurbished and redesigned, with a wealth of amenities and dining options. Boston Park Plaza is superbly located amid shopping, transportation, restaurants and historic destinations that inspire discovery. 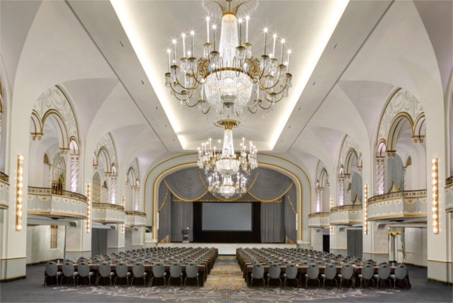 The Boston Park Plaza Conference room block has sold out. Conference attendees and sponsors can still make reservations at the Park Plaza by calling 617-426-2000. Cancellations of individual reservations will be accepted up until 3:00pm three days prior to arrival date, at which point a one night non-refundable deposit will be charged to credit card on file. Other nearby hotels with competitive rates include The Midtown Hotel (866-276-6393), Boston Common Hotel (866-279-5332), Westin Copley Place (888-627-7216) or the Copley Square Hotel (866-599-6674). Logan International Airport is located in East Boston, just 3 miles away from the Boston Park Plaza. It has four major terminals, each with its own ticketing, baggage claim, and ground transportation facilities and offers nonstop service to 42 international cities. Massachusetts Bay Transportation Authority, MBTA offers rail, bus, subway, and boat options. Visit www.CityOfBoston.gov for more information on Boston. In November, the weather in Boston ranges between a high of 49° and a low of 36°.